When private restaurants (paladares) were introduced from the 1990s onwards, a clutch of competent cooks began to flourish—notably at La Guarida, the beautiful film set for Cuban cult film Fresa y Chocolate, and La Esperanza, decked out like a colonially beautiful stage and ever popular despite the famously bitchy service. They flourished, though, because there was nowhere else to go. For the most part, prohibitive taxes and regulations, ignorance about entrepreneurialism and a dearth of produce meant the majority of restaurants remained uninspired front-room affairs, rotating a distinctly uncreative set of Cuban staples serving stodgy comida criolla: roast chicken, pork or fish served with rice, beans, and salad. Street food was pizza with the consistency of cardboard, the famous Cuban sandwich descended to reconstituted ham and cheese with the texture and taste of foot mould, and chicken fried in cheap oil reused for the hundredth time. The only place you could be sure to eat well would be at someone’s house. But the winds of change have been blowing, and what started as a gentle gust a few years ago is picking up speed. Since the state sanctioned the establishment of small private firms there has been an explosion of paladares. Chefs are returning from overseas with capital to fund homegrown projects, and there is increasing competition at multiple levels for clients, staff and produce. The results have been exciting, transforming the dining experience in Havana from one of minimizing pain and playing it safe into a myriad of gourmet possibilities. You can now eat well at somewhere different for lunch and dinner daily for a fortnight and still have paladares to spare. We have picked eight places for you, the very best over a course of a week. El Litoral Monday El Litoral opened its doors after extensive renovations in January 2014 in a renovated mansion almost next door to the US interest section. The ceilings are high but this is a modern finish with tasteful and elegant furniture. The menu is extensive with a range of tapas—try the foccacia de papa, pulpo y ajo tostado (Focaccia with octopus and garlic), mejillones rellenos ‘Tigres’ (stuffed tiger Mussels) and Cazuela de chorizo al vino, pimienta y pan (Spanish sausage with wine and pepper) or just order a plate for the best-stocked cold cuts and salad bar in Havana. Santy Tuesday In Jaimanitas, a down-at-heel fishing village within Havana’s westerly city limits, this is a sushi joint far from the sanitised sections of Old Havana. This renovated fisherman’s shack perches on the water’s edge where ramshackle boats collect. At this spit-and-sawdust paladar they turn the catch of the day into sashimi, nigiri and California rolls. Octopus and fresh fish are on the menu, which isn’t written down. It’s zingy, delectable and fresh. 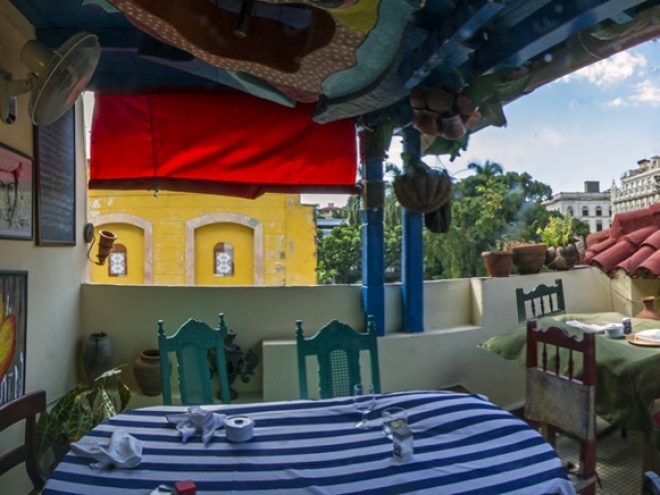 La Casa Wednesday La Casa is more than just a restaurant; it is the crucible of the Robaina family, from the 91-year-old great grandmother to the latest great grandson and everyone in between. Located on the ground floor of a 1950s modernist house with a well-ventilated outdoor terrace and enclosed air-conditioned room, its menu is dedicated to international fusion. Look for spinach crepe stuffed with chicken jardinière, Galician style octopus and Marinated clams. Thursday night is sushi night and a wonderful Japanese chef presides. Casa Miglis Thursday Michel Miglis’ Casa Miglis is the first restaurant to open serving Scandinavian cuisine (yes, really) since the revolution. The menu features such rare ingredients as “lingonberries from deep in the Swedish forests.” The light and airy interiors are designed by Swede Andreas Hegert. Staples such as Skagen toast and meatballs join spicy couscous. Aside from the corny 1980s ballads soundtrack, you could be in Madrid or Lisbon. Anywhere in Europe, Miglis’ restaurant would be par for the course. In the decrepit streets of Central Havana, it feels like a little miracle. El Cocinero Friday Accessed via the imposing brick chimney of an old peanut oil factory, up three flights of circular stairs, this alfresco rooftop, which is as industrial and chic as any urban bar in London’s Shoreditch or on Manhattan’s Lower East Side. The service is fast and purposeful under the watchful eye of the dynamic Rafael. This is clearly the place to be for a mixed crowd of affluent young Cubans, expatriates and travelers in the know. The well-executed fish and meat dishes are best enjoyed in the new restaurant on the first level, before drifting upstairs for more excellent cocktails. La Guarida Saturday The film set for Fresa y Chocolate, La Guarida’s ambiance is set by the incredible approach up a sweeping staircase. It’s the Cuban version of The Ivy, so Hollywood actors dine here when they’re in town—as do rafts of Cuban musicians. Bookings are essential and you are greeted warmly by Enrique Núñez, who despite being Cuba’s most famous restaurateur, still hustles to make sure that everything is just right. Top picks include the eggplant caviar, gazpacho, caimanero (fresh grouper) and watermelon with grilled shrimps. Iván Chef Justo Sunday (Lunch) Opposite the Museum of the Revolution, upstairs eatery Iván Chef Justo is cosy, airy, unpretentious, filled with memorabilia and often kissed by a Mediterranean-esque breeze, especially on the miniature upstairs terrace. The chef-owner, Iván himself, is mostly in situ, locked in intense concentration in the small kitchen. An eclectic, indulgent menu includes baby lamb ribs, shiitake mushroom stir-fry and freshly grilled fish. Atelier Sunday (Dinner) Atelier is the baby of Nuris Higuera. Her interiors are bohemian pretty: each table topped with colored glass pieces, vintage colonial crockery and crocheted tablecloths for a knowing dash of delicate Cubanía. Contemporary Cuban art is rotated regularly, creating a constantly changing living art gallery. The service is attentive but not overbearing. It’s like being at a pleasingly secret bolthole in the fashionable villages of northern Ibiza. March 2014 Cet article fait partie du numÉro de fÉvrier 2014 de What’s On La Havane The definitive monthly travel & culture guide to Havana Download our current issue of What?s On Havana, your definitive travel, culture and entertainment guide for all things happening in Havana, Cuba?s bustling and enigmatic capital city. We include features from around Cuba written by the best international travel writers covering Cuba. Our monthly online digital magazine is also available in Spanish and French.